Addresses some fundamental considerations associated with the engineering of large scale systems. The first part deals with systems methodology, design and management including a detailed examination of operational and task level system quality assurance through configuration management, audits and reviews, standards and systems integration. The second part discusses a variety of systems design and management approaches, particularly those concerned with system effectiveness evaluation and the human role in systems. Andrew Patrick Sage (August 27, 1933- October 31, 2014) was an American systems engineer and Emeritus Professor and Founding Dean Emeritus at the School of Information Technology and Engineering of the George Mason University. Born in Charleston, South Carolina Sage received his BA in 1955 in Electrical Engineering at The Citadel, The Military College of South Carolina, his MA in 1956 in Electrical Engineering from Massachusetts Institute of Technology, and his PhD also in Electrical Engineering in 1960 at the Purdue University. 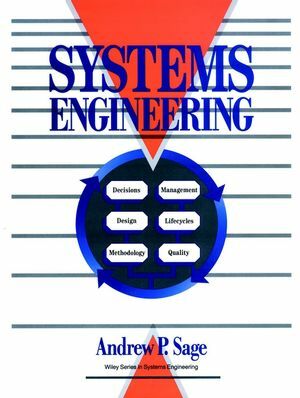 Systems Engineering Processes and Life Cycles. Operational and Task Level System Quality Assurance ThroughConfiguration Management, Audits and Reviews, Standards, andSystems Integration. Strategic Quality Assurance and Management. Information Requirements, Risk Management, and Associated SystemsEngineering Methods. Microeconomic Systems and Cost and Operational EffectivenessAnalysis.